Heat oven to 375°F. In medium bowl, mix chicken, cheese, celery and 3 tablespoons sauce. Separate dough into 8 triangles. Spoon about 2 tablespoons chicken mixture on wide end of each triangle. Starting at shortest side of triangle, roll up, gently wrapping dough around filling; press to seal. Place on ungreased large cookie sheet. Brush with additional sauce. Bake 14 to 16 minutes or until golden brown. 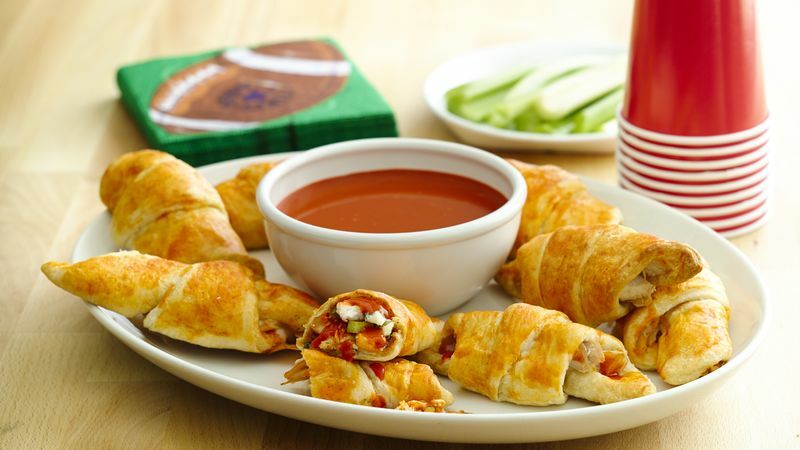 Serve with additional sauce for dipping. Try crumbled feta cheese in place of the blue cheese, if you like.